This month I’m doing 30 Days of Painting in order to get more comfortable with a brush. I’d love to feel confident enough to illustrate my stories for myself and my family. I’ve been playing with brush work, lettering, color washes, and more. Then I started filling it in with color, basically at random. I accidentally took this picture with a color filter on, but I can’t go back in time to get the moment. 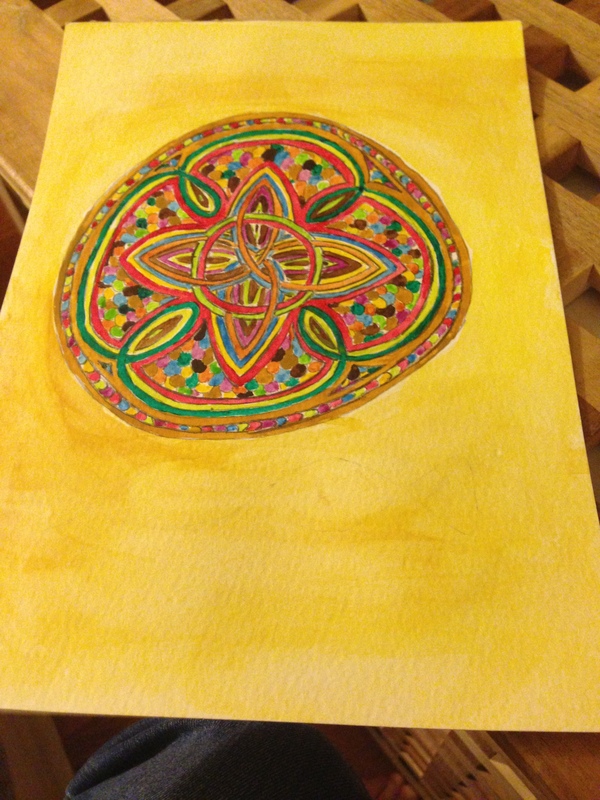 Then I went back and amped up some of the colors and want back over it with a pencil to define the edges. I’d like to go over it with a darker outline, though. But I still like it. It was really fun to draw too. It’s a fun thing to do when you want to clear your mind. I borrowed hers while I was in Oklahoma visiting my mom, stuck in a hospital room with a cloudy mind. It brought me back to the good quiet moments of my childhood. Of course, yours is superior because you actually DREW that. I certainly couldn’t do anything that detailed! BTW, have you ever worked with watercolor pencils? I found out about these in high school when an artist let me and a friend come into his studio to draw/paint each other. They are really fun to work with because you can get that precision without sacrificing the painterly qualities you want from watercolor. Oh my goodness, I love coloring books and that looks like a great one. 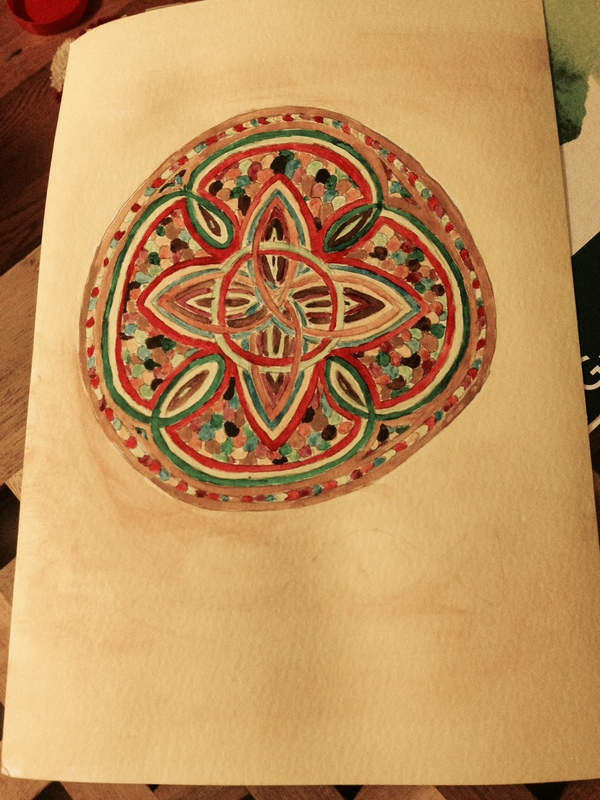 I have a wonderful Book of Kells coloring book that I break out when ever I have the time. Drawing it was actually easier than I thought it would be – the irregularities contribute to the illustrative style, and I didn’t really attempt any particular shapes, just letting whatever happened happen. I’ve never actually used water color pencils, but I think they’d be perfect for this kind of work – I’ll have to check them out! I think you’ll love watercolor pencils. They’re fairly inexpensive, easily portable, and so versatile. I love watching art take form. I like how parts of the knot have a tessellated appearance. A very welcome departure from the green and black Celtic knots I’m used to seeing. Thank you! 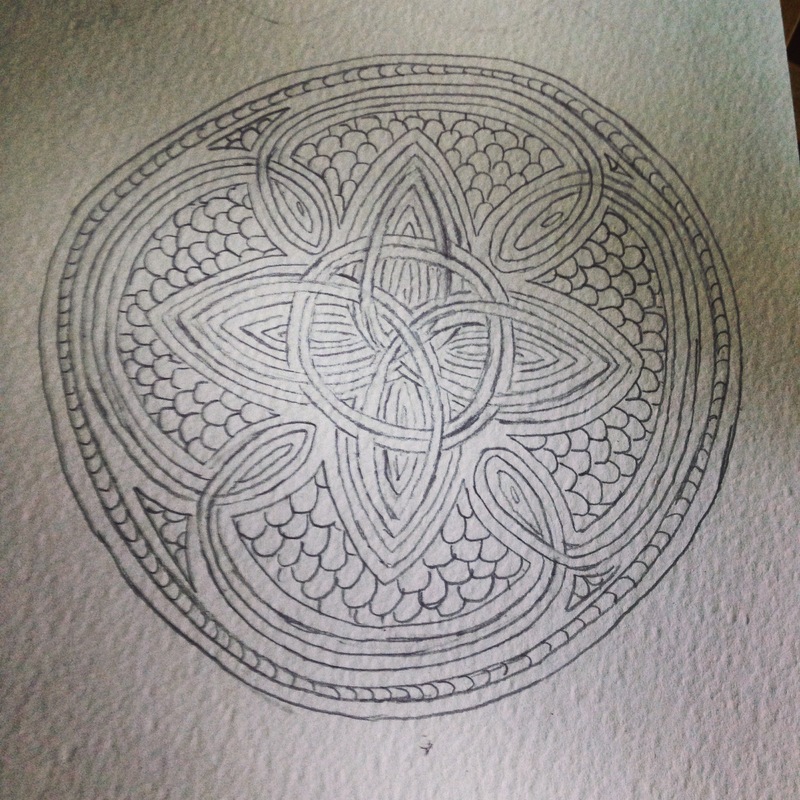 Weirdly, I now want to do a green and black celtic knot. The tessellation is pretty common medieval technique – I just stole it outright!